I love bikes. I am a crazy cycling fan. My love for bikes formed as a child when I received my first hand-me-down bike, with the added basket, from my older brother Tom. When I later took over his daily bike paper-route, it was a proud day indeed. That paper route was then passed to my younger brother Mike, who himself is now a crazy cycling fan. 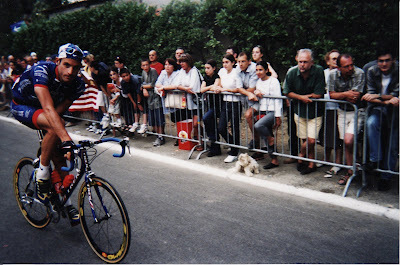 My own love of pro cycling emerged in 2001 as I stood roadside in Pau, France, in the heart of the Pyrennes, waiting for Stage #15 of the Tour de France to depart Northeast 232.5 km to the city of Lavaur. Eight months earlier I was told I should never run, swim, or bike again. As any endurance athlete would do, I responded to the doctor's recommendation with an honest, "you must be kidding". Now I found myself in Pau, France, with my brother, his wife, and good friend Stevo. We were standing inside the barriers (due to a lucky last minute VIP pass). I recall watching George Hincapie with his wide grin roll by on his blue Trek bike. Next came Jan Ullrich, and then JaJa, Verenque, Zabel, Beloki, Eki, and Mayo. Standing there watching the pageantry roll to the start line, I felt a clear moment when the air stilled and a calm came over me and I dared myself to think, "I have to do this". And so began my journey to learn about the sport of road cycling. Of course I had been a mountain biker in Colorado, something I explained, I did solely to keep in shape to carry those heavy backpacks to the base of rock and ice climbs. But this new sport of road cycling was something more - it was a lifestyle change. I had found my new passion. I became not only a rider, but a huge cycling fan. The shift was slow but complete. In 2003 I returned to France for 23 days to ride 16 days and chase the Tour de France from the Alpes to the Pyrenees to Paris. In Paris, I participated in the Randonnée du Centenaire, a ride with 10,000 other citizens, up and down the Champs Elysees to celebrate the 100th Tour de France. I saw Miguel Endurain and Lance Armstrong and other legends of cycling past and present. I remember being thrilled on my flight home to introduce myself and speak to a long admired climbing legend Conrad Anker. Somehow I was keenly aware that my idea of hero was now shifting. I was changing, rock climbing was no longer my passion. My pristine training regimen was easily let go. I laughed at myself as I dug into a grilled basque sausage, of unknown origin, on the top of Luz Ardiden while waiting for Lance Armstrong to emerge from the fog to win Stage 15 in 2003. By now, it had sunk into me, that going with the flow at the Tour de France leads to wonderful unexpected experiences. I was fortunate to return to France again in 2005, 2007, and 2008. I happily (and sometimes painfully) pedaled my way up many of the mighty passes of the Alpes and the Pyrenees. I participated in the Etape du Tour, learned the roads and towns, got stuck in the traffic near TDF mountain-top finishes, and learned just how incredibly hardy the French cycling fan could be. I am proud to be a cycling fan. Back in the USA, I happily awake at 5:30am to watch the races in Europe live online. I can bore anyone who pretends to listen about history and race predictions. I think cycling humor is about as funny as it gets. The problem is I only know about 16 other die-hard cycling fans, and 7 of those are in my own family! I have decided I need to encourage 2 more fans every year, and 3 new riders. I am certain, all 16 of my family & friends love cycling and love bikes - and I love them more for it.